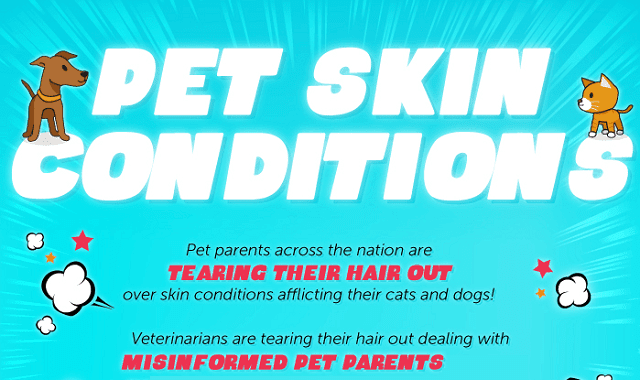 The Top Causes of Pet Skin Conditions #Infographic ~ Visualistan '+g+"
Pet owners find that both cats and dogs have many issues with skin care. These pet owners often are quick to self-diagnose their pet’s problems by searching online for the solutions. Because of this many veterinarians are forced to deal with misinformed pet parents. Many pet parents are fooled into thinking that their pets have skin cancer or a condition that can only be remedied with an expensive diet solution. Advanced Dermatology wanted to clear up any misconceptions about the causes of pet skin conditions. They teamed up with Krista Magnifico who is an experienced vet who has practiced veterinary medicine for over 12 years. The result of their collaboration is a really extensive infographic that covers everything about pet skin care. In the graphic they cover the top causes behind common pet skin conditions as well as the signs pet owners should look out for. To learn more, check out the infographic below.